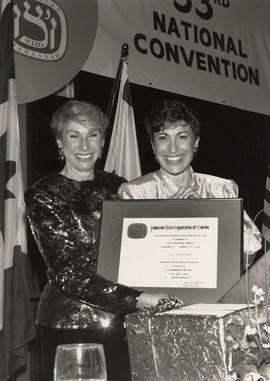 Photograph depicts Mrs. Iora Yorse holding her plaque, which reads, "Presented to: Mrs. Iora Yorse, Top Canvasser, UJA Women's Division, 1955-1961." Photograph depicts six men at a B'nai B'rith event where a trophy is being awarded. Photograph depicts a man giving an award to a girl. Photograph depicts four unidentified men, three holding B'nai Brith plaques. Photograph depicts three unidentified men holding an award.Written on the verso: "P. 6 - 3 x 3 1/2 64%. B. B. presents award to Cable 10. March 8/79." Photograph depicts two men holding a framed Akiba Award. 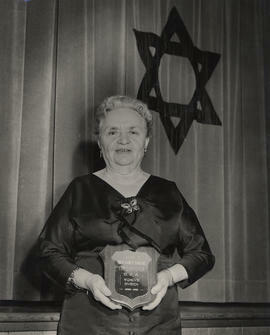 A menorah is shown in the background.